I wasn’t familiar with sun dogs, until my son Marshall spotted one when we were together one day. They are amazing! We’re all bundled up and waiting for them storm! Have a good day, MJ. 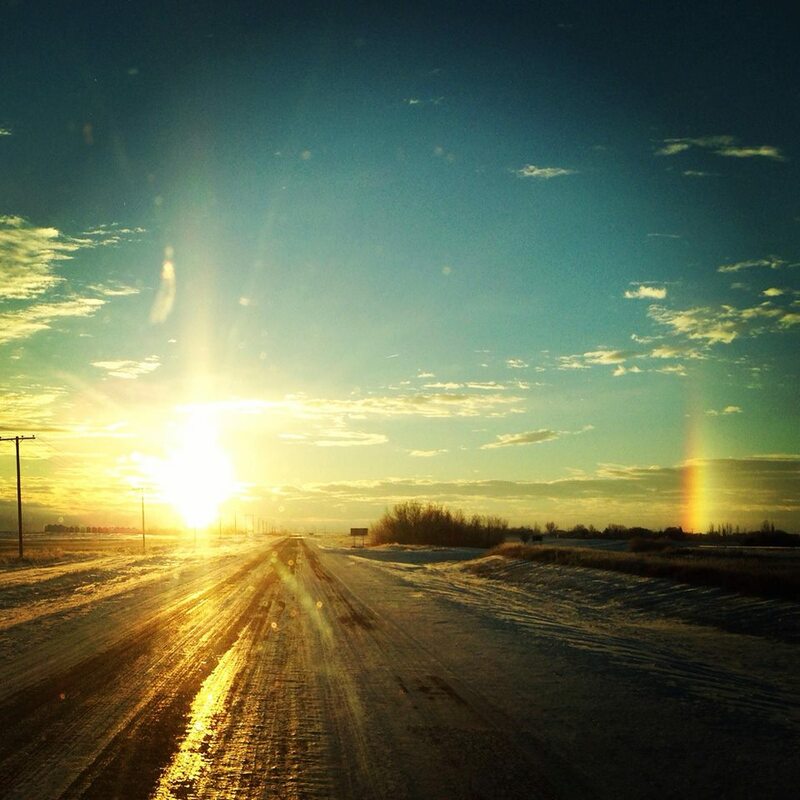 Thanks for sharing your sun dog photos! They’re beautiful – and something else to appreciate up in the sky 🙂 Hope you weathered the big storm ok, Dianna! We’re fine! But all this snow is a bit unusual for us. And it’s 9 (NINE) degrees here this morning! BRRRRRRRR! Wow, the one with the rainbow prism to the right is perfect! I must say it was you who gave a name to an early sunset photo I took around 5:00 in the afternoon…no, not a sunset but an almost white sun with a rainbow to the left. You named it a “sundog” and now I know. Thank you for bringing yours from your neck of the woods. I did? Cool! It’s those little shared experiences that make our world feel just a bit smaller, no? Interesting. I’ve never seen a sun dog before. 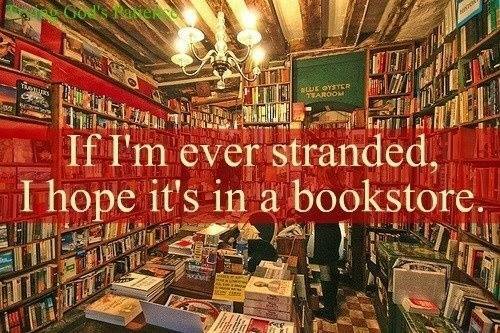 And if I were to be stranded, I’d LOVE it be at a bookstore–at the Strand, specifically, would be awesome! A bookstore with a Starbucks would work for me. It they had a fireplace I would move in. I saw one two days ago, but I didn’t know what it was. I had never seen one before, so I just took some time to appreciate as a special gift. Thanks for enlightening me. I’ve been too busy being cranky in morning traffic to notice sundogs. I promise, tomorrow I will forget about other drivers and try to appreciate my surroundings beyond the freeway! Yes!! to the bookstore with coffee or tea. Maybe Oprah’s house. She’d have a chef there and all that. 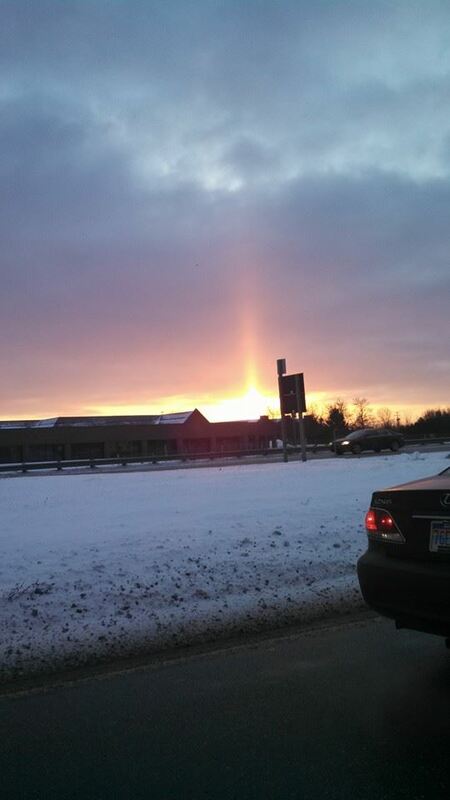 I don’t know that I’ve ever seen a sundog, or if I did, I didn’t know what I was seeing. Hope your hubby’s trip goes well. We’ve had snow since about 4:00 p.m., and it is expected to leave 6-12″ around our area. This is not something we see often. Nope, he connected through ATL, was supposed to be in FL by 5:30 Tues, he arrived around 1:30am – it was touch and go if they’d even leave ATL, AND, by that time, there were no hotels left. He’d have been sleeping in the airport. He was grateful to get there, but it was one long day for the non-flying-loving Virgo. Thank you. I always thought sun dogs were the prisms created in the sky on either side of the sun but I see it’s more dramatic than that. kewl. I’d never heard of a sundog before. Amazing. Thanks for sharing.